This 7.62x39 ammunition for AK and SKS rifles is equally at home punching holes in paper targets or animals. Manufactured in Russia at the Barnaul Machine Plant, it fires a 125 grain soft point bullet that delivers strong expansion without excess fragmentation and meat loss. 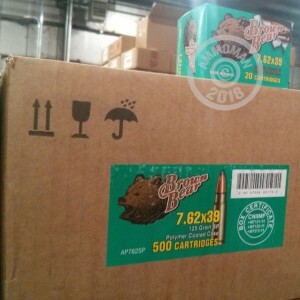 These cartridges come in a case of 500, divided into 25 boxes of 20 rounds each. Unlike surplus ammo, these rounds are newly manufactured and use non-corrosive Berdan primers. The non-reloadable steel cases help keep the cost of the ammo down and come with a coating that ensures reliable cycling. Grab this case or any other items over $99 at AmmoMan.com to qualify for free shipping!